A portion of the redevelopment of Glassboro New Jersey's Town Square, Wed. Aug. 23, 2017. Recreating Glassboro is something of a homecoming for Dante Germano, who grew up in the town where his father ran a pool hall. “I spent a lot of time down here,” he said, looking out over the new development – a stone’s throw from where Danny’s Rec Center once stood. But as malls developed, downtown businesses fell on hard times, scraping along or even closing down, like his uncle’s bakery. RELATED STORY: Glassboro summit at 50: when superpowers met in S.J. Seedy was a kind description for Glassboro then. “There was crime, killing, loud music and fighting,” recalled downtown barber and High Street businessman Biagio “Ben” Marciante. “But they finally decided to do something and now it is really, really better,” said Marciante of the remade downtown his tidy shop now looks out on. The revitalization is in large part due to Germano and his company. He is the chief financial officer of Nexus Properties, which is midway through an ambitious development project connecting the remains of the aging South Jersey borough with a freshly reimagined downtown, with a town square where High Street, the traditional downtown, hits Rowan Boulevard, the spine of the new development. Rowan University is new name reflecting a new mission, the school having begun as a "normal school," better known as a teacher's college, in 1923. The college changed to Glassboro State College in the 1950s. But the town, built on glass making, remained cloistered from the college, a commuter-based cluster of just a few academic buildings on one end of town. Industrialist Henry Rowan and his wife Betty donated $100 million to the school, then the largest gift ever to a public college or university. Rowan changed its name from Glassboro. The first move was creating an engineering school of the first order. 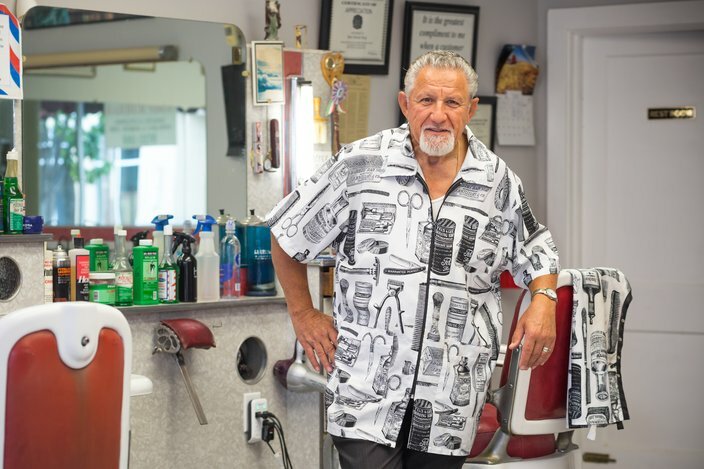 Ben Marciante has owned Ben's Barber Shop in Glassboro, Gloucester County, for 26 years. Not all that long ago, the town was better known for 'crime, killing, loud music and fighting,' he says. The college earned university status and soon embarked on an aggressive expansion – which included the rundown borough's core. As a result, Glassboro grew population, rather than losing people as it had for years. The town has about 20,000 residents today. The boulevard expansion includes new classrooms for the college’s graduate and continuing education programs, retail, luxury apartments and a 1,200-space parking garage. Buildout will take another year to complete, but the apartments and garage have opened. 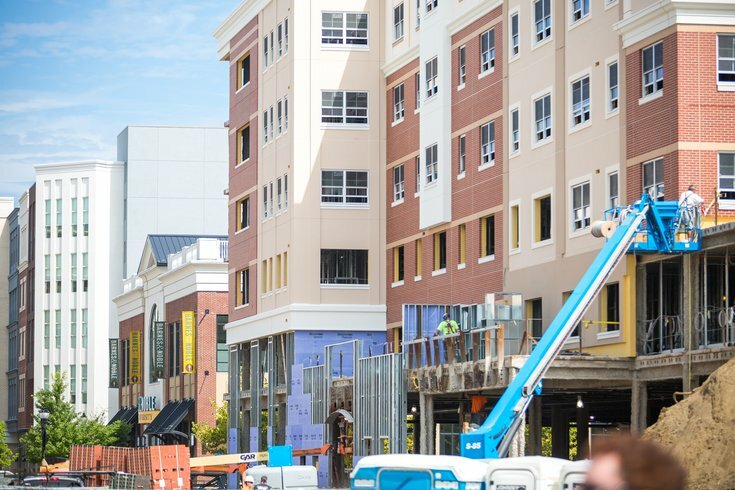 In partnership with Rowan University and the borough government, Nexus has $300 million in a project branded as Glassboro Main Street/Rowan Boulevard. 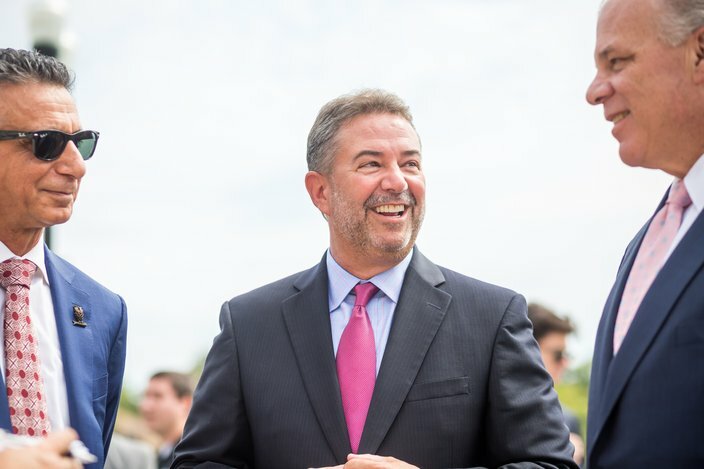 Dante Germano, center, chief operating office and chief financial officer of Nexus Properties, is joined by Rowan University President Dr. Ali Houshmand, left, and New Jersey state Senate President Stephen Sweeney at a ribbon-cutting for the newly-redeveloped Town Square in Glassboro on Aug. 23, 2017. Germano grew up in the town. It’s the largest public/private development in New Jersey, spurred on by state tax credits, which explains in part why state Senate President Steve Sweeney showed up to shake the hands of Germano, Rowan President Ali Houshmand and borough administrator Joseph A. Brigandi Jr. Earlier related development brings the entire investment in the downtown to around $400 million, according to Germano, who was back on his old stomping grounds as apartments opened for tours. 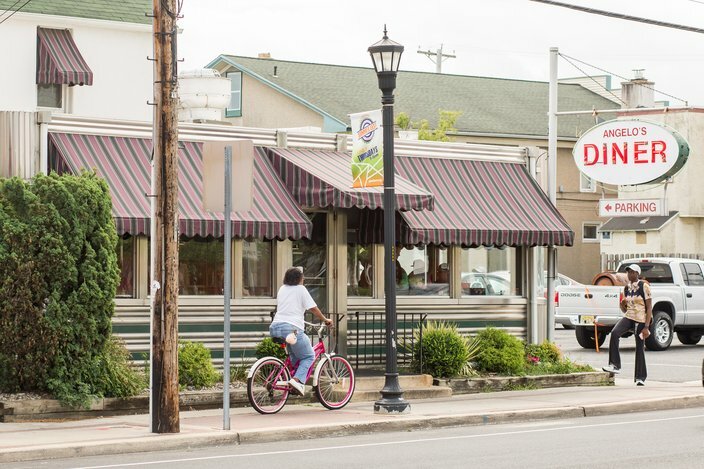 Once filled with rundown homes, tattered frat houses and weedy lots, Glassboro is now unmistakably a college town, but in partnership with local government. “That was the intention,” said Brigandi, who used to play soccer with Germano back in their high school days. “As the university goes, so goes the borough,” added Briagandi. Though not everyone has embraced the gentrification. The old and the new: Angelo's Diner, which opened in 1946 on Main Street, is located adjacent to the newly-redeveloped Glassboro Town Square. Other forum posters grumbled they have yet to see any reductions in their tax bills, despite the new business and development in the town. But McKenna McNally, 19, who was standing in line waiting for a seat at Angelo’s, a throwback diner downtown which still only takes cash, is a fan. She visits Glassboro now from her home in nearby Mullica Hill to hear live music and frequents food trucks which assemble regularly. “It wasn’t very nice, with lots of abandoned and scummy buildings. Now, it is a community place,” she said. “It’s awesome!” says Sherry Dvorak of Mullica Hill, left, about Glassboro. “It’s the vision of a university town.“ She was enjoying a beverage with her friend Wendy Gundrum at the Barnes and Noble book store at Rowan University at Town Square. Her pal, Wendy Gundrum, has watched the transformation since arriving from out of state back in 1985. Gundrum, another Mullica Hill resident, has just one complaint: Traffic now sometimes comes to a standstill because of all the development and business.